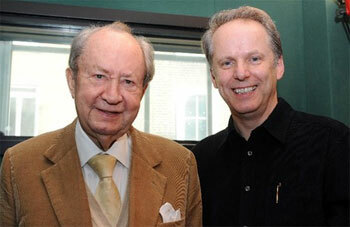 Peter Sallis with Wallace and Gromit creator Nick Park. Recently I had a request from a viewer as to the health of Peter Sallis, who played Clegg in Last of the Summer Wine. Sadly, it appears that the veteran actor isn't doing too well right now. News of the actor's health was delivered at an event this past May in Scotland, when Nick Park, the creator of Sallis's Oscar nominated film Wallace and Gromit, warned that the famous plasticine duo "may have had their last adventure". According to Park, 93-year-old Sallis is not too well. Like Judi Dench, he suffers from the eye condition macular degeneration and although Park would love to make more Wallace and Gromit films without Sallis, it would be difficult. 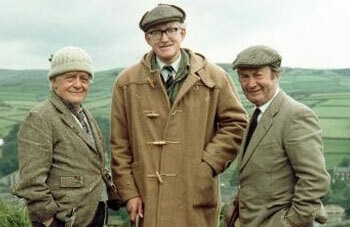 Compo (Bill Owen), Foggy (Brian Wilde) and Clegg (Sallis) in LOTSW. Sallis was first approached to voice Wallace by Park in 1982, as part of Park's graduation project at the National Film and Television School. It would be another eight years though before Sallis was hired, at the grand sum of about $50. The film went on to be nominated for an Oscar and Sallis's northern accent became known the world over, despite the fact that he wasn't actually a northerner, but had been born in Middlesex. Having appeared in all 295 episodes of Last of the Summer Wine, Sallis probably had enough practice perfecting his Northern dialect. The year Last of the Summer Wine ended, 2010, was also the year that Sallis last voiced Wallace. Although an understudy was found to replace him on projects he didn't' want to do, such as video games, or when Wallace's voice was needed for an exhibition, the voice was never quite the same. Some people - probably those who had grown up watching and listening to Sallis as Yorkshireman Clegg - spotted the difference. They could tell, explained Park, that "it's not really Sallis' voice and they have been quite critical in their assessment of the understudy, insisting he sound nothing like Wallace". Whether or not Sallis becomes healthy enough to undertake another film, the actor voicing him also played a big part in what his character looked like. Wallace didn't for instance, have a wide mouth, until Sallis first said "cheese". If I hear anything else about Mr. Sallis' health I'll be sure to let you know. In the meantime, you can see the actor in good form every weekday at 1:30pm on Afternoon Tea. If there's an actor you'd like to see featured in Tea Time Tidbits, feel free to drop me a line.